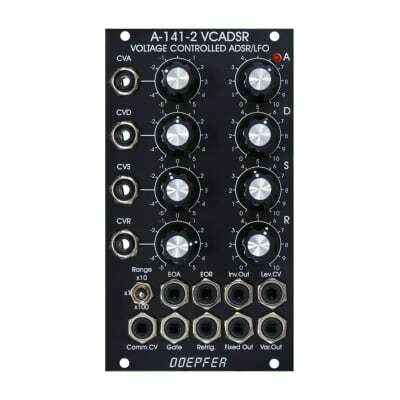 Module A-141-2 is the successor of the obsolete former VCADSR module A-141. 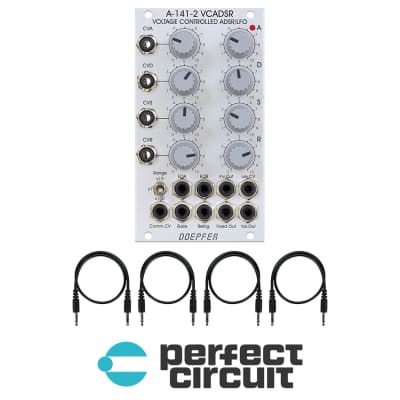 Compared to the A-141 a lot of improvements and expansions have been added: common control voltage input for all time parameters (A/D/R), range switch for three different time ranges, inverted ADSR output, additional output with voltage controlled level (i.e. built in output VCA), digital outputs for End of Attack (EOA) and End of Release (EOR), EOR is e.g. required for the VCLFO mode. variable envelope output (Var.Out) control voltage input (Lev.CV) that controls the level of this output (nothing but an additional VCA behind the fixed output), e.g. for dynamic applications, where the envelope level is controlled by a velocity voltage, +5V control voltage corresponds to amplification +1 (i.e. the same +7V level as the fixed output), control voltages beyond +5V are possible and will increase the level until clipping occurs at about +12V. two different modes of the variable envelope output can be selected by means of an internal jumper: normal VCA mode (as described above) or Polarizer mode (in this mode 0V CV corresponds to inverted envelope signal, about +2.5V correspond to no signal and +5V correspond to non-inverted envelope).